There are a few details regarding WWE's plans for Halftime Heat during this year's Super Bowl. 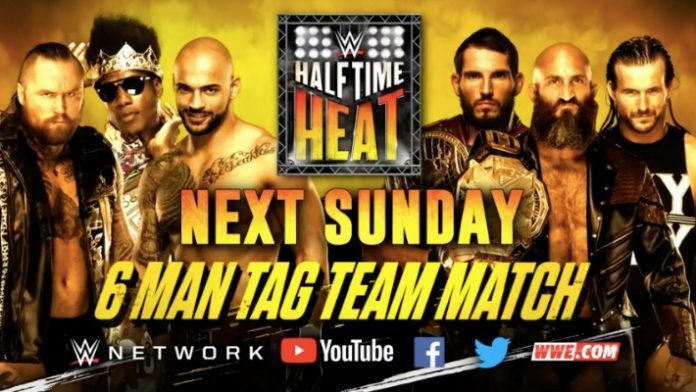 Halftime Heat is set to make its return this weekend. It will take place during halftime of this year’s Super Bowl between the New England Patriots and Los Angeles Rams. Fans can watch the event on the WWE Network, YouTube, Facebook, and Twitter. A Six-Man NXT Tag Team match will go down. Aleister Black, Ricochet, and Velveteen Dream will take on NXT Champion Tommaso Ciampa, NXT North American Champion Johnny Gargano, and the Undisputed Era’s Adam Cole. PWInsider reports that WWE officials want to air the event live so there are no spoilers. Current plans have the match taking place at the WWE Performance Center in Orlando, Florida. WWE has the option of bringing in local fans to have a crowd. However, they could also use a bunch of wrestlers as extras. Perhaps WWE could do an Empty Arena match, much like the first-ever Halftime Heat 20 years ago between The Rock and Mankind. Early speculation suggested Halftime Heat would be filmed at Full Sail University during this week’s NXT TV tapings. WWE Hall Of Famer Shawn Michaels will serve as a guest commentator for the bout. The first-ever Halftime Heat occurred 20 years ago. Mankind defeated The Rock in an Empty Arena match to win the WWE Championship on January 31st, 1999. That same day, the Denver Broncos defeated the Atlanta Falcons in Super Bowl 33. Will you be tuning in to watch Halftime Heat during the Super Bowl?